Our Michigan bicycle accident injury lawyers represent victims of bike accidents on streets, highways, and roadways. We also represent bicyclists injured in parking lots and in crosswalks. Settlement claims can often be filed for their personal injuries as a result of the accident. In cases involving fatalities, the families of the person killed can file a Michigan wrongful death claim. We can help you if your bicycle accident was today or anytime in the past. Do I Have To File A Police Report After A Bicycle Accident? Michigan law requires drivers to report any accident involving a motor vehicle that causes more than $1,000 in property damage, results in death or injury, or damages an unattended vehicle or other property. A written report is not always required. However, many insurance company policies require that you file written report with a police agency be filed within twenty-four hours of the accident to qualify for insurance benefits. You can get a copy of your traffic crash report (UD-10) from the police agency that investigated the accident. For accidents investigated by the Michigan State Police, you can purchase your report online through the Traffic Crash Purchasing System. If you were injured in the bicycle accident, you should contact your insurance company immediately to report any damage to your bike and injuries to yourself. For injuries that require medical treatment, you will need to file an Application for No-Fault Insurance Benefits if you qualify under Michigan law. No-Fault insurance benefits are benefits you are entitled to receive under Michigan law, regardless of fault, if you were injured in a bicycle accident that arose out of the ownership, operation, maintenance or use of an automobile as an automobile, such as a car or truck. Video: Can I Get No-Fault Insurance Benefits After A Bicycle Crash? A bicyclist can always get No-Fault insurance benefits under Michigan law, even if the bicyclist did not own an automobile or have an auto insurance policy. Benefits will either come from your own car insurance, the car insurance of a family member, or from the insurance company of the negligent driver that you on the bike. If none of these people had insurance, you can get benefits through the Michigan Assigned Claims Plan. Can I Sue The At Fault Driver If I Was Hit By A Car On My Bike? You can sue the at-fault driver for your personal injuries suffered in the accident. You can also sue the owner of the vehicle driven by the at fault driver. These claims provide money compensation for your pain and suffering, psychological damages, disability, and scars caused by the accident. How Much Time Do I Have To Sue Someone After A Bicycle Accident? What Is The Average Settlement For A Michigan Bicycle Accident? There is no “average” bicycle accident settlement that is used as a basis for determining the payout amount in your case. Every claim is completely different and based upon a number of factors. How Much Can I Get For Bicycle Accident Settlement? There are many factors used to determine what your bicycle accident claim is worth. The amount of your settlement will depend on the seriousness of your injuries, the type and length of your medical treatment, and how the injuries have affected your ability to lead a normal life. What Are The Claims In A Bicycle Accident Lawsuit? The term "damages" in a lawsuit refers to the type of harm a person has suffered as a result of the accident. If the case goes to trial, the jurors are asked to evaluate the different damages for a specific case. The jury then decides the dollar amount for each type of damage claim proven at trial. In a case involving the death of the bicyclist, the surviving family members can file a wrongful death lawsuit. These cases seek damages for conscious pain and suffering of the bicyclist from the time of accident until death, the loss of society and companionship of surviving family members, loss of income and support, and other economic damages. Quite often, there are no witnesses to the bike accident and the police listen to the driver's version of the accident. This can result in the police officer wrongfully place the fault on the bicyclist. Many times, the bicyclist is in an ambulance on the way to the hospital when the police interview the negligent driver. We have had many cases in which the police never even get the bicyclist's version of the story and this results in blame being placed on the wrong person. 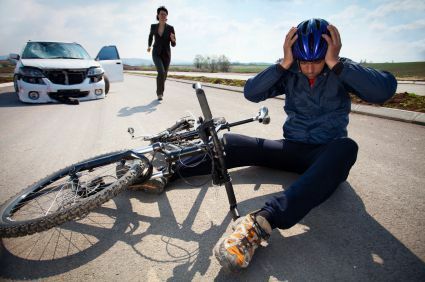 It is important that if you or someone you care about is injured that you hire an experienced Michigan bicycle accident attorney immediately to begin the investigation of your claim. Hiring an attorney early is important so that important evidence can be obtained, such as photographs and witness statements, that can help prove and win your case. There is no specific formula, guideline, or calculator used to determine the right amount of a bicycle accident settlement. There are many factors that insurance companies and attorney's use to determine the value of a bike accident injury case. These include the fault of the driver, any fault attributed to the bicyclist, the seriousness of the injuries, the type of medical treatment, the presence of any scars or disfigurements, and the length of time of disability. Every case is different so a careful evaluation of all facts must be considered before agreeing to a settlement. The insurance policy limits of the negligent driver and the owner of the vehicle also play an important factor in determining the settlement amount. Our legal team will consider every one of these factors and then work to get you the highest possible settlement for your case. Our expert Michigan bicycle accident lawyers win the highest possible settlements and jury verdicts. Below is an example of bicycle accident lawsuits won by our award winning law firm. $ 290,000 Settlement for a client who was injured while riding a bike on Mackinaw Island. $ 250,000 Settlement for a Macomb County wrongful death lawsuit filed against a motorist. $ 100,000 Settlement for a bicycle rider who suffered serious injuries in Monroe. $ 100,000 Settlement for a 65 year old man who was struck while riding his bike in Clinton Township. $ 90,000 Settlement for a bicyclist struck by an SUV in Garden City. $4,500,000 settlement. A bus passenger was killed in a Detroit accident when he was run over while removing his bicycle from the front of a bus. $2,000,000 wrongful death lawsuit verdict. A minor riding a bicycle was killed when a pickup truck driving on the bike path stopped suddenly and reversed over the child. The property owners were also held liable for permitting vehicular traffic on a children’s bike path. $1,750,000 settlement in Oakland County, Michigan for a child hit by a car while riding his bike through an intersection. He suffered a traumatic brain injury. $1,750,000 arbitration award for a for a child hit by a car in a crosswalk in Oakland County, Michigan. $1,250,000 fatal bike accident settlement. A bicyclist was killed in an Otsego rural road when he was struck from behind by a motor vehicle. The driver of the vehicle mistakenly believed she had given the bicyclist enough room as she tried to pass. The bicyclist sustained severe injuries in the collision that lead to his ultimate death. How Long Does It Take To Get A Bicycle Accident Settlement? The length of time that it takes to get paid a settlement is different in every case. Some cases settle quickly because the injuries are serious and the insurance policy limit is low, so the adjuster will pay the entire policy quickly. However, most cases can take up to a year or more after the accident to get a settlement check because the victim is still recovering and the future effect of the injuries are unknown. Do I Need A Lawyer To Settle My Bicycle Injury Case? How Much Does It Cost To Hire A Bicycle Accident Attorney? It does not cost anything to hire our bicycle accident lawyers. We do not charge any fees to start your case and only get paid when you receive your settlement check. This is called a contingency fee agreement. Under this arrangement, we also pay all of the case expenses for you and get a percentage of the settlement at the very end of the case when your check is received. We will represent you in your bicycle accident case under our no-fee promise. This means that you will not be charged any legal fees whatsoever unless we obtain a settlement or recovery for you. You have absolutely no obligation for legal fees unless we win your case. If we do not obtain a settlement for you, you owe us nothing. For more information regarding your rights after a Michigan bicycle accident, call our experienced bike accident attorneys now at (800) 606-1717 to discuss your case. We will determine if you are eligible to receive no-fault insurance benefits and receive a settlement. We have helped bicyclists just like you who have suffered serious injuries in biking accidents. Call us today to schedule your free consultation. There are absolutely no fees unless you receive a settlement. There were 1,988 bicyclists involved in auto accidents in Michigan in 2016. Of that total, 1,526 bicyclists were injured according to police traffic crash reports. There were 38 fatal bicycle crashes on Michigan roadways. The majority of the bicycle accidents occurred during daylight hours, with the peak hours of 5:00 - 5:30 p.m.. for crashes. The peak time for fatal crashes was at night from 9:00 - 9:30 p.m. Male bicyclists account for the majority of those injured, including those killed in fatal bicycle accidents. Fortunately, there were no bicycle deaths involving children in 2014.